ugar Creek, Missouri, police said Tuesday that officers did not use excessive force after a video surfaced showing police smashing a man’s car window and arresting him on the ground. SUGAR CREEK, Mo. 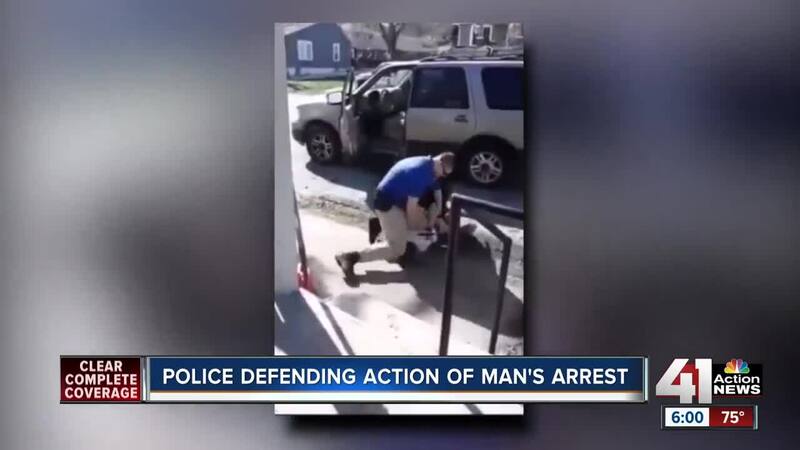 — Sugar Creek, Missouri, police said Tuesday that officers did not use excessive force after a video surfaced showing police smashing a man’s car window and arresting him on the ground. Police said officers responded to Sugar Creek City Hall on Monday after a person, identified as Aaron Fletcher of Sugar Creek, reportedly caused a disturbance while requesting information from an officer’s personnel file. After officers left, they learned that Fletcher had six warrants for his arrest, as well as a revoked driver’s license. They saw him leave City Hall and attempted to pull him over. Fletcher, who identifies as a sovereign citizen, refused to pull over and led officers on a low-speed chase, police said. He eventually stopped on the street where he lives. Body camera video obtained from the Sugar Creek Police Department shows officers asking Fletcher to get out of his car. When he refuses, an officer smashes the car window using his baton. Officers tried to remove Fletcher from the vehicle, but he continued to resist, and officers took him to the ground, police said. One officer struck Fletcher in his thigh twice with a baton before he was eventually placed in handcuffs. The Sugar Creek police chief said Tuesday that his officers did not use excessive force in the incident. "Officers are trained on the baton. They are trained to hit nerve spots. It was in a soft spot of the leg, which is a nerve that will help gain compliance," Police Chief Chris Soule said. But Fletcher’s daughter disagrees with police. "You didn't have to put your hands on him. Don't hit him with the stick. We've seen that," Akeya Fletcher, 20, said. "It did not take two of you guys basically pushing each other around trying to get him out of the car." Soule said that while he dislikes these situations, sometimes they happen. Fletcher has been arrested three times since December for various offenses. Police said that on Tuesday morning, he was still refusing to be booked into jail, saying that “police have no jurisdiction over him and he only answers to God.” He later agreed to be booked. Akeya Fletcher has this hope for her father. Fletcher, who was charged with driving while revoked, eluding the police, resisting arrest and failure to obey a lawful order, posted a $4,000 bond late Tuesday.